CVCLT will actively strive to reduce its carbon footprint and improve the local environment for the long-term benefit of the communities it serves. Climate change, fuel poverty, public health, flood resilience and environmental stewardship are the main drivers behind this commitment. Reducing our carbon footprint: We aim to reduce the amount of energy – including embodied energy – used by the homes we develop, the buildings we manage and the activities we undertake. Using resources widely: Through careful procurement and robust recycling, we aim to consume fewer resources and produce less waste and/or pollution. Encouraging positive behaviour: We aim to encourage and enable the people we house and the communities with whom we work to use less energy, reduce their fuel bills, consume fewer resources and produce less waste. We will support them in doing this and encourage positive behaviour change. • To use Bioregional’s 10 Principles of One Planet Living as a framework for delivering on our sustainability commitments. • To work with contractors and suppliers to reduce the carbon footprint and waste streams of our supply chain. • To encourage and support the people we house and the communities we serve in reducing their carbon footprint and waste streams. • To tackle fuel poverty by reducing the energy requirements of our housing. • resilient to flooding and that help mitigate the risk of flooding elsewhere. • To take a ‘fabric first’ approach to energy-efficient design, minimising the use of expensive, high-tech solutions. • To use materials that are natural, renewable and, if practical, locally sourced. • To produce a Sustainability Action Plan for each scheme we build reviewing it regularly and setting challenging targets. • To identify environmental champions from among our trustees, tenants and wider membership. CVCLT aims to devote sufficient resources – both human and financial – towards tackling sustainability issues. However, it is currently a relatively small organisation, operating under tight financial constraints. A value-for-money exercise and cost/benefit analysis should be carried out wherever potential expenditure falls outside budgeted guidelines. If action has to be denied or postponed due to insufficient funds, it should be recorded and reported to the Board of Trustees. CVCLT is committed to the principles of equality and diversity, practising equal opportunities for all. The sustainability policy should be applied consistently and fairly across the trust’s operations. The Board of Trustees is responsible for ensuring CVCLT delivers on the commitments and principles contained in this policy. A Sustainability Review Group will meet whenever necessary, but at least once per year. The Group should be drawn from the wider membership as well as from the trustees. Specific tasks should be allocated to members of the group through an Action Plan, with overall responsibility for delivery lying with the Board of Trustees. The Action Plan and Achievements should be reported to members annually. Members are responsible for supporting the Board of Trustees in delivering the strategic aims and objectives contained in this policy. This policy has been produced following consultation with the trust’s members at a workshop following the 2016 AGM. 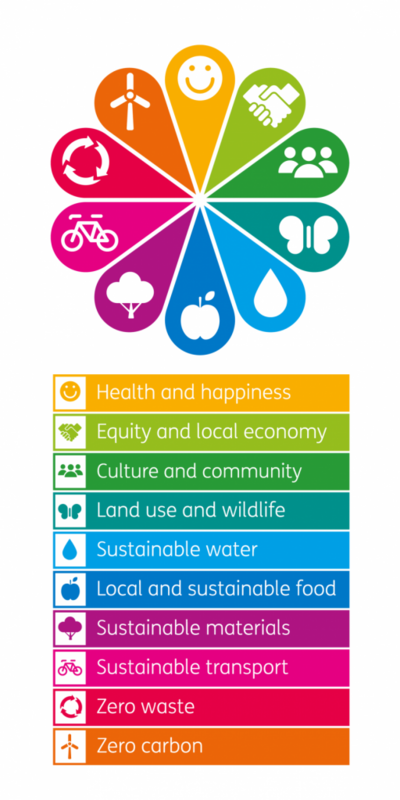 BioRegional’s 10 principles of one planet living.